Hi Everyone! My name is Caroline, and I have 3 year-old twin balls of energy, Ben and Tess. We've been part of FIT4MOM for just over a year now. This spring I decided to take a step outside my comfort zone and sign up for Body Back. 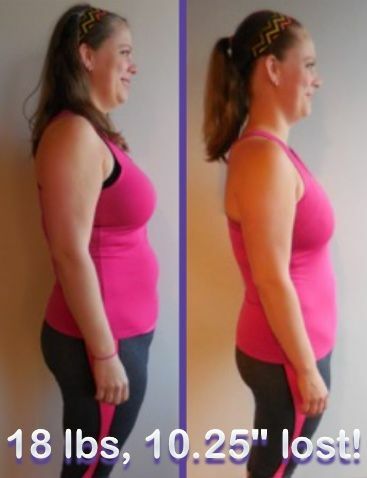 I had been working on losing the baby weight for about two years, and just hadn't managed to make any long term progress. I would get serious about my diet, lose a few pounds, and then there would be a stressful event. I'd pack on the pounds again, plus a little more. I was tired of feeling fat and stress eating. So I did it. I figured that, if nothing else, spending the money would force me to do two extra workouts each week. I have to be honest. The first week was daunting. The nutrition guide said no sugar or artificial sweeteners. How was I supposed to function without my lattes!?! Or wine, or chocolate? Then we did the initial assessments and I saw my numbers in black and white. I was nearly thirty pounds heavier than my pre-baby weight. I could only manage 11 sit-ups in a minute. I decided that enough was enough. I committed to sticking with the plan 100%. It was time to get healthy and get my body back. After the first two weeks, the nutrition plan became more natural for me. I stopped wanting my super sweet morning latte. I found myself looking forward to the HIIT workouts. And I began seeing results. When I started Body Back, my goal was to lose ten pounds and stop stress eating. I reached that goal halfway through the eight weeks. I was amazed at how fast the pounds were melting off and at how incredible I felt. I had more energy and I wasn't feeling like my stress levels dictated my food choices. I also stopped finishing my kids’ snacks. It's amazing how all those Bunnies and Veggie Straws add up! Overall, I lost 18 pounds and 10.25 inches during the eight weeks of Body Back. I increased my sit-ups to 24 and I can do 20 full push-ups in one minute! I started jogging (something I'd never voluntarily done before) and my wall sits are completely horizontal these days. I stuck with the workouts through Body Back Boost over the summer, and now I've lost 26 pounds overall. I’ve also gone from a 38 to a 34 in bra band size. The physical results are amazing, but my true victory has been so much more. I learned that I can do anything. My body and spirit are so much stronger than I knew. My instructor was there to guide and encourage me, but I did the work and made the changes and fought through killer workouts to reclaim my body. I relearned the art of taking care of myself, instead of just my family. I take the time I need to prepare a healthy lunch, grab a bottle of water, work out without children, and sleep. And it has made a big difference. I'm a healthier, happier, and more confident person. I even wore a two piece bathing suit to the beach this summer! Body Back makes good on the promise of its name, and so much more. I encourage you to do it for yourself—you can! Drop in classes are also available starting January 9th! View schedule here.